with PSYKO PUNKZ @ Eventstage Krems! Die Eventstage Krems ladet Euch zu dem neuen Hardstyle Event mit zahlreichen Top-Acts ein - wir präsentieren Euch am Samstag, 06. 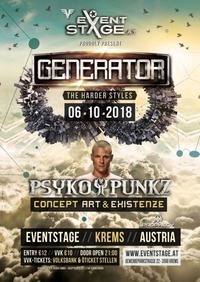 Oktober 2018, das neue Eventformat "Generator - The Harder Styles"! Dass wir an diesem Abend "PSYKO PUNKZ" aus den Niederlanden für Euch einfliegen werden! Als Support Acts geben Concept Art & Existenze so richtig GAS! The great Hardstyle Act from Netherlands! Defqon.1 - Qlimax - Q-Dance Stage @ Tomorrowland - Mysteryland - Electric Love Festival and many more! Audacious, motivated and passionate; music is the core of his being. Perseverant, tenacious and avid; throughout all musical ventures, he strives to cultivate individuality... Creating timeless tunes that exhibit signature authenticity, Wietse Amersfoort, or better known as energetic Hardstyle titan Psyko Punkz is, without a doubt, one of the modern industry’s most significant game-changers. A new hard Event is born - GENERATOR - THE HARDER STYLES! und weitere Packages auf Anfrage!